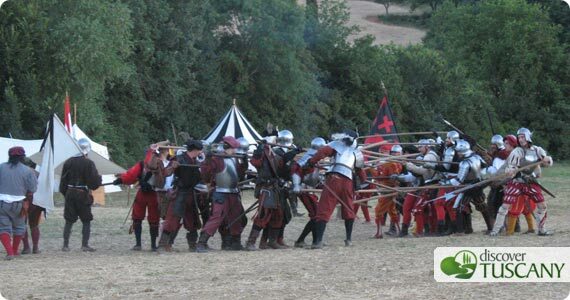 Blog / Events / The Medieval Festival of Monteriggioni! We just got back from the Medieval Festival in Monteriggioni! With a spectacular setting such as Monteriggioni is it easy to fall back into a Medieval atmosphere. The many characters in costume do the rest: from the “nobility” dressed in elaborate, rich costumes to the soldiers and knights challenging each other to duels in the streets to the stalls selling traditional crafts and showcasing old trades. Again this year one could find traditional local products on sale, from cheeses, candies and wines to valuable artisan products including knives, leather items and hand-crafted books. Everything can be purchased in “grossi“, the coin that was in use at that time in the castle of Monteriggioni (of course all also accept euros 😉 ). This year, the historical reconstruction of the 1526 siege of the castle by the Florentine army and following battle with the Sienese army was particularly well organized and staged. The battle took place outside the walls on the fields below the fortress, as it did centuries ago, and included a well choreographed clash between infantry and artillery. The costumed soldiers brought to life hostility between the two armies, while the cannons, protagonists in the show, gave impressive performances 🙂 . Monteriggioni was really quite packed this Saturday evening, and to eat a panino we had to wait about half an hour in line…. if you go (we highly recommend it, check the official site for next year’s dates), try to be smarter than us and eat during off times! The festival is rich in attractions and entertainment so it is difficult to see everything: jugglers, jesters, dancers on stilts and musicians perform in the main piazza as well as parade along the narrow streets. The show of women on stilts this year left us a bit astonished… it was a bit “dark” and difficult to follow, last year the dancers were much more cheerful! The festival’s soundtrack was once again fortunately organized by the Compagnia La Giostra, bringing revelry and cheer and making everyone in Monteriggioni dance and sing. We’re looking forward to the medieval festival in Volterra in August and to seeing them once again perform! The festival is worth the 20 euros we paid to get in (10 euros each) and the steep cost of some of the food and drinks. If you find yourself in Tuscany next July, we highly recommend you go! And why not dress up in Medieval costumes as well? We are planning something along those lines for our next visit 😉 . Based in Florence, you can spend Saturday in Florence, Sunday in Florence, then Monday in Pisa (half day there, then Lucca for rest of the day before heading back to Florence). Main museums in Florence are closed on Mondays, so that’s why I suggest Pisa/Lucca on Monday. I will be traveling to Florence/Tuscany on April 19-21. We are taking a train from Rome to Florence on the morning of April 19th and renting a car. My daughter will have already spent a few days in Florence before I arrive, so she wants to go to the Tuscany area. Can you recommend good places to stay that would be central to our visit? Are there good Airbnbs? What would be a good 3 day itinerary? Would definitely want to see wine country, beautiful drives, art,etc. Thanks for your help!! I suggest staying in Chianti, so that you are central: you can visit the Chianti hilltop towns of Castellina, Greve, Panzano, Radda, and also San Donato in Poggio, San Gimignano, Siena. 3 days will fly by but should be enough to see these places. Check out http://www.tuscanyaccommodation.com for places to stay in the area. I suggest you book quickly since that is Easter weekend and should be quite busy, you might already have difficulty finding availability.